This article is about the theological concept. For other uses of the term, see Limbo (disambiguation). In Catholic theology, Limbo (Latin limbus, edge or boundary, referring to the "edge" of Hell) is a doctrine concerning the afterlife condition of those who die in original sin without being assigned to the Hell of the Damned. 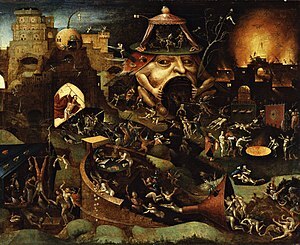 Medieval theologians of western Europe described the underworld ("hell", "hades", "infernum") as divided into four distinct parts: Hell of the Damned, Purgatory, Limbo of the Fathers or Patriarchs, and Limbo of the Infants. However, Limbo of the Infants is not an official doctrine of the Catholic Church. The "Limbo of the Patriarchs" or "Limbo of the Fathers" (Latin limbus patrum) is seen as the temporary state of those who, despite the sins they may have committed, died in the friendship of God but could not enter Heaven until redemption by Jesus Christ made it possible. 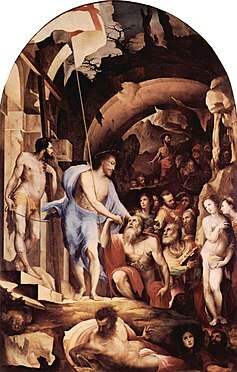 The term "Limbo of the Fathers" was a medieval name for the part of the underworld (Hades) where the patriarchs of the Old Testament were believed to be kept until Christ's soul descended into it by his death through crucifixion and freed them (see Harrowing of Hell). The Catechism of the Catholic Church describes Christ's descent into Hell as meaning primarily that "the crucified one sojourned in the realm of the dead prior to his resurrection. This was the first meaning given in the apostolic preaching to Christ's descent into Hell: that Jesus, like all men, experienced death and in his soul joined the others in the realm of the dead." It adds: "But he descended there as Saviour, proclaiming the Good News to the spirits imprisoned there." It does not use the word "Limbo". This concept of Limbo affirms that admittance to Heaven is possible only through the intervention of Jesus Christ, but does not portray Moses, etc. as being punished eternally in Hell. The concept of Limbo of the Patriarchs is not spelled out in Scripture, but is seen by some as implicit in various references. Luke 16:22 speaks of the "bosom of Abraham", which both the Roman Catholic Church and the Eastern Orthodox Church, following early Christian writers, understand as a temporary state of souls awaiting entrance into Heaven. The end of that state is set either at the Resurrection of the Dead, the most common interpretation in the East, or at the Harrowing of Hell, the most common interpretation in the West, but adopted also by some in the East. Jesus told the Good Thief that the two of them would be together "this day" in "Paradise" (Luke 23:43; see also Matthew 27:38); but on the Sunday of his resurrection he said that he had "not yet ascended to the Father" (John 20:17). Some say that the descent of Jesus to the abode of the dead, his presence among them, turned it into a paradise. Others understand the text to mean not "I say to you, This day you will be with me in paradise", but "I say to you this day, You will be with me in paradise". Timothy Radcliffe explained the "today" as a reference to the "Today of eternity". Jesus is also described as preaching to "the spirits in prison" (1 Pet 3:19). Medieval drama sometimes portrayed Christ leading a dramatic assault—The Harrowing of Hell—during the three days between the Crucifixion and the resurrection. In this assault, Jesus freed the souls of the just and escorted them triumphantly into heaven. 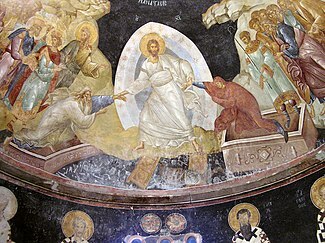 This imagery is still used in the Eastern Orthodox Church's Holy Saturday liturgy (between Good Friday and Pascha) and in Eastern Orthodox icons of the Resurrection of Jesus. The doctrine expressed by the term "Limbo of the Fathers" was taught, for instance, by Clement of Alexandria, who maintained: "It is not right that these should be condemned without trial, and that those alone who lived after the coming (of Christ) should have the advantage of the divine righteousness." The Limbo of Infants (Latin limbus infantium or limbus puerorum) is the hypothetical permanent status of the unbaptized who die in infancy, too young to have committed actual sins, but not having been freed from original sin. Recent Catholic theological speculation tends to stress the hope, although not the certainty, that these infants may attain heaven instead of the state of Limbo. While the Catholic Church has a defined doctrine on original sin, it has none on the eternal fate of unbaptized infants, leaving theologians free to propose different theories, which magisterium is free to accept or reject. Limbo is one such theory. In countering Pelagius, who denied original sin, Saint Augustine of Hippo was led to state that because of original sin, "such infants as quit the body without being baptized will be involved in the mildest condemnation of all. That person, therefore, greatly deceives both himself and others, who teaches that they will not be involved in condemnation; whereas the apostle says: 'Judgment from one offence to condemnation' (Romans 5:16), and again a little after: 'By the offence of one upon all persons to condemnation' (Romans 5:18)." The Council of North African bishops, which included Augustine of Hippo, held at Carthage in 418 did not explicitly endorse all aspects of Augustine's stern view about the destiny of infants who die without baptism, but said in a section of one canon (not found in all manuscripts) that there is no "intermediate or other happy dwelling place for children who have left this life without Baptism, without which they cannot enter the kingdom of heaven, that is, eternal life". So great was Augustine's influence in the West, however, that the Latin Fathers of the 5th and 6th centuries (e.g., Jerome, Avitus of Vienne, and Gregory the Great) did adopt his position. In the later medieval period, some theologians continued to hold Augustine's view. In the 12th century, Peter Abelard (1079–1142) said that these infants suffered no material torment or positive punishment, just the pain of loss at being denied the beatific vision. Others held that unbaptized infants suffered no pain at all: unaware of being deprived of the beatific vision, they enjoyed a state of natural, not supernatural happiness. This theory was associated with but independent of the term "Limbo of Infants", which was forged about the year 1300. If Heaven is a state of supernatural happiness and union with God, and Hell is understood as a state of torture and separation from God then, in this view, the Limbo of Infants, although technically part of hell (the outermost part, "limbo" meaning "outer edge" or "hem") is seen as a sort of intermediate state. The question of Limbo is not treated in the parts of the Summa Theologica written by Saint Thomas Aquinas himself, but is dealt with in an appendix to the Supplement added after his death by Fra Rainaldo da Piperino. The Limbo of Infants is there described as an eternal state of natural joy, untempered by any sense of loss at how much greater their joy might have been had they been baptized: "Every man who has the use of free-will is adapted to obtain eternal life, because he can prepare himself for grace whereby to merit eternal life; so that if he fail in this, his grief will be very great, since he has lost what he was able to possess. But children were never adapted to possess eternal life, since neither was this due to them by virtue of their natural principles, for it surpasses the entire faculty of nature, nor could they perform acts of their own whereby to obtain so great a good. Hence they will nowise grieve for being deprived of the divine vision; nay, rather will they rejoice for that they will have a large share of God's goodness and their own natural perfections. Nor can it be said that they were adapted to obtain eternal life, not indeed by their own action, but by the actions of others around them, since they could be baptized by others, like other children of the same condition who have been baptized and obtained eternal life: for this is of superabundant grace that one should be rewarded without any act of one's own. Wherefore the lack of such a grace will not cause sorrow in children who die without Baptism, any more than the lack of many graces accorded to others of the same condition makes a wise man to grieve." Because children below the age of reason did not commit actual sin, theologians came to the common view that these unbaptized children feel no pain at all or even that they enjoy a full, though only natural, happiness through their mediated union with God in all natural goods (Thomas Aquinas, Duns Scotus). The Ecumenical Council of Florence (1442) spoke of baptism as necessary even for children and required that they be baptised soon after birth. This had earlier been affirmed at the local Council of Carthage (417). The Council of Florence also stated that those who die in original sin alone go to hell, but with unequal pains as those in actual mortal sin. John Wycliffe's attack on the necessity of infant baptism was condemned by another general council, the Council of Constance. The Council of Trent in 1547 explicitly stated that baptism (or desire for baptism) was the means by which one is transferred "from that state wherein man is born a child of the first Adam, to the state of grace, and of the adoption of the sons of God, through the second Adam, Jesus Christ, our Saviour. Through the 18th and 19th centuries, individual theologians (Bianchi in 1768, H. Klee in 1835, Caron in 1855, H. Schell in 1893) continued to formulate theories of how children who died unbaptised might still be saved. By 1952 a theologian such as Ludwig Ott could, in a widely used and well-regarded manual, openly teach the possibility that children who die unbaptised might be saved for heaven. He also told about Thomas Cajetan, a major 16th-century theologian, that suggested infants dying in the womb before birth, and so before ordinary sacramental baptism could be administered, might be saved through their mother's wish for their baptism. In its 1980 instruction on children's baptism the Congregation for the Doctrine of the Faith stated that "with regard to children who die without having received baptism, the Church can only entrust them to the mercy of God, as indeed she does in the funeral rite established for them",:13 leaving all theories as to their fate, including Limbo, as viable possibilities. And in 1984, when Joseph Ratzinger, then Cardinal Prefect of that Congregation, stated that he rejected the claim that children who die unbaptised cannot attain salvation, he was speaking for many academic theologians of his training and background. The Church's teaching expressed in the 1992 Catechism of the Catholic Church is that "Baptism is necessary for salvation for those to whom the Gospel has been proclaimed and who have had the possibility of asking for this sacrament." It adds that "God has bound salvation to the sacrament of Baptism, but he himself is not bound by his sacraments". It recalls that, apart from the sacrament, "baptism of blood" (as in the case of the martyrs) and in the case of catechumens who die before receiving the sacrament, explicit desire for baptism, together with repentance for their sins, and charity, ensures salvation. It states that, since Christ died for all and all are called to the same divine destiny, "every man who is ignorant of the Gospel of Christ and of his Church, but seeks the truth and does the will of God in accordance with his understanding of it, can be saved", seeing that, if they had known of the necessity of baptism, they would have desired it explicitly. It then states: "As regards children who have died without Baptism, the Church can only entrust them to the mercy of God, as she does in her funeral rites for them. Indeed, the great mercy of God who desires that all men should be saved, and Jesus' tenderness toward children which caused him to say: 'Let the children come to me, do not hinder them,' allow us to hope that there is a way of salvation for children who have died without Baptism. All the more urgent is the Church's call not to prevent little children coming to Christ through the gift of holy Baptism." Merely stating that one can "hope" in a way of salvation other than baptism, the Church thus urgently reiterates its appeal to baptize infants, the only certain means to "not prevent" their "coming to Christ" for salvation. Our conclusion is that the many factors that we have considered above give serious theological and liturgical grounds for hope that unbaptized infants who die will be saved and enjoy the beatific vision. We emphasize that these are reasons for prayerful hope, rather than grounds for sure knowledge. There is much that simply has not been revealed to us. We live by faith and hope in the God of mercy and love who has been revealed to us in Christ, and the Spirit moves us to pray in constant thankfulness and joy. What has been revealed to us is that the ordinary way of salvation is by the sacrament of baptism. None of the above considerations should be taken as qualifying the necessity of baptism or justifying delay in administering the sacrament. Rather, as we want to reaffirm in conclusion, they provide strong grounds for hope that God will save infants when we have not been able to do for them what we would have wished to do, namely, to baptize them into the faith and life of the Church. Pope Benedict XVI authorized publication of this document, indicating that he considers it consistent with the Church's teaching, though it is not an official expression of that teaching. Media reports that by the document "the Pope closed Limbo" are thus without foundation. In fact, the document explicitly states that "the theory of limbo, understood as a state which includes the souls of infants who die subject to original sin and without baptism, and who, therefore, neither merit the beatific vision, nor yet are subjected to any punishment, because they are not guilty of any personal sin. This theory, elaborated by theologians beginning in the Middle Ages, never entered into the dogmatic definitions of the Magisterium. Still, that same Magisterium did at times mention the theory in its ordinary teaching up until the Second Vatican Council. It remains therefore a possible theological hypothesis" (second preliminary paragraph); and in paragraph 41 it repeats that the theory of Limbo "remains a possible theological opinion". The document thus allows the hypothesis of a limbo of infants to be held as one of the existing theories about the fate of children who die without being baptised, a question on which there is "no explicit answer" from Scripture or tradition. The traditional theological alternative to Limbo was not Heaven, but rather some degree of suffering in Hell. At any rate, these theories are not the official teaching of the Catholic Church, but are only opinions that the Church does not condemn, permitting them to be held by its members, just as is the theory of possible salvation for infants dying without baptism. Neither the Eastern Orthodox Church nor Protestantism accepts the concept of a limbo of infants; but, while not using the expression "Limbo of the Patriarchs", the Eastern Orthodox Church lays much stress on the resurrected Christ's action of liberating Adam and Eve and other righteous figures of the Old Testament, such as Abraham and David, from Hades (see Harrowing of Hell). Some Protestants have a similar understanding of those who died as believers prior to the crucifixion of Jesus residing in a place that is not Heaven, but not Hell. The doctrine holds that Hades has two "compartments", one an unnamed place of torment, the other named Abraham's Bosom. Luke 16:19–16:26 speaks of a chasm fixed between the two which cannot be crossed. Those in the unnamed "compartment" have no hope, and will ultimately be consigned to hell. Those in Abraham's bosom are those of whom it is written of Jesus, "When He ascended on high, He led captive a host of captives..." (Eph. 4:8, quoting Psa. 68:18). These individuals, the captives, now reside with God in Heaven. Both "Compartments" still exist, but Abraham's Bosom is now empty, while the other chamber is not, according to this doctrine. Mormons teach that "all who have died without a knowledge of [the] gospel, who would have received it if they had been permitted to tarry, shall be heirs of the celestial kingdom of God." Jehovah's Witnesses, Christadelphians, and others have taught that the dead are unconscious (or even nonexistent), awaiting their destiny on Judgment Day. The Zoroastrian concept of hamistagan is similar to limbo. Hamistagan is a neutral state in which a soul that was neither good nor evil awaits Judgment Day. In Islam, which denies the existence of original sin in totality, the concept of Limbo exists as Barzakh, the state that exists after death, prior to the day of resurrection. During this period sinners are punished and the adequately purified rest in comfort. Children however are exempt from this stage, as they are regarded as innocent and are automatically classed as Muslims (despite religious upbringing). After death they go directly to Heaven, where they are cared for by Abraham. In Classical Greek Mythology, the section of Hades known as the Fields of Asphodel were a realm much resembling Limbo, to which the vast majority of people who were held to have deserved neither the Elysian Fields (Heaven) nor Tartarus (Hell) were consigned for eternity. In Buddhism, Bardo (Sanskrit: antarabhāva) is sometimes described as similar to limbo. It is an intermediate state in which the recently deceased experiences various phenomena before being reborn in another state, including heaven or hell. According to Mahāyāna Buddhism, the arhat must ultimately embrace the path of the bodhisattva, despite having reached enlightenment. The Laṅkāvatāra Sūtra states that an arhat obtains a "samādhikāya (rapture-body)" and is reborn in a lotus in a transitory state of existence, unable to awaken for a whole eon. This is likened to a person intoxicated who must spend a certain period of time before becoming sober. In the book series Harry Potter, Harry Potter, the main character is described as being in Limbo, after Voldemort attempts to kill him. Limbo is described as a state of the mind where the person is unconscious, and living in their own mind. This acts as a path from the world to the afterlife, to choose whether to go back, or to go "on." In the Divine Comedy poem Inferno, Dante depicts Limbo as the first circle of Hell. The virtuous pagans of classical history and mythology inhabit a brightly lit and beautiful—but somber—castle which is seemingly a medieval version of Elysium. They include Hector, Julius Caesar, Virgil, Electra, and Orpheus. Virtuous non-Christians, such as the Muslim Saladin, were also described as among its residents. One of Nobel Prize-winning poet Seamus Heaney's best known works is titled Limbo. In the Artemis Fowl series, "Limbo" is the timeless plane of existence where the demon fairies are trapped until The Lost Colony. In the film Inception, Limbo is a deep subconscious level, far beyond false awakening, and a state in which the characters may be trapped indefinitely. In the 1973 adult film The Devil in Miss Jones, The main character Justine Jones who just killed herself by slitting her wrists somehow finds herself in Limbo. In The Monster Squad, a 1987 comedy/horror film written by Shane Black and Fred Dekker, the way to defeat the monsters is to open a hole in the universe and cast them into Limbo. In The Matrix Revolutions, third and last installment of The Matrix series, Neo gets trapped in a train station named Mobil Ave. He learns that the station (located "nowhere") is a sort of borderworld, passage between the "Matrix" and the "Machine" (the place where the Machines reside in the real) world. Mobil is an anagram of Limbo. In the final episode of the BBC time travel/cop show Ashes to Ashes (Series 3, Episode 8), it is revealed that the world that Alex Drake awoke to after being shot, which Sam Tyler described and that other major characters inhabit, is a kind of Limbo, one seemingly specifically for members of the police force, who had died in violent or sudden ways. In the indie game Limbo, a boy walks through a black and white world searching for his sister. In DmC: Devil May Cry, Limbo is a parallel dimension in which the main setting of Limbo City becomes a demonically influenced version of its real world counterpart. The demons that rule Limbo City can drag their victims into Limbo and manipulate the landscape to create twists and turns to entrap the protagonist, Dante. In Marvel Comics, Limbo is the name of 2 dimensions: one is a section outside of time ruled over by a future version of Kang the Conqueror called Immortus, the other is a dimension of demons commonly under the rule of Belasco. In DC Comics, Limbo is a dimension inhabited by old characters who have been removed from continuity or seemingly abandoned or forgotten. "In Limbo" is the 11th track on Genesis' debut album "From Genesis to Revelation". "In Limbo" is the 7th track on Radiohead's 2000 album "Kid A". In the BBC CW TV series The Vampire Diaries, a form of limbo called "The Other Side" is created by a powerful witch named Qetsiyah, creating it as a Purgatory for all supernatural (vampires, witches, werewolves, doppelgängers, hybrids, etc.) beings go in death, it prevents any supernatural being from reaching a form of Heaven called "Peace". In Warframe, one of the many playable Warframes is named Limbo, who has the ability to travel through a second dimension called the Rift Plane, by tapping into the Void to his advantage against his enemies and in some support to his allies. ^ Catholic Encyclopedia: Hell: "However, in the New Testament the term Gehenna is used more frequently in preference to hades, as a name for the place of punishment of the damned. ... held in abomination by the Jews, who, accordingly, used the name of this valley to designate the abode of the damned (Targ. Jon., Gen., iii, 24; Henoch, c. xxvi). And Christ adopted this usage of the term." Jewish Encyclopedia: Gehenna: Sin and Merit: "It is frequently said that certain sins will lead man into Gehenna. The name "Gehenna" itself is explained to mean that unchastity will lead to Gehenna (; 'Er. 19a); so also will adultery, idolatry, pride, mockery, hypocrisy, anger, etc. (Soṭah 4b, 41b; Ta'an. 5a; B. B. 10b, 78b; 'Ab. Zarah 18b; Ned. 22a)." ^ François Xavier Schouppe (2010). Abridged course of religious instruction, apologetic, dogmatic, and moral: for the use of Catholic colleges and schools. Burns & Oates. p. 248. ^ Anne Clark Bartlett, Thomas Howard Bestul (1999). Cultures of Piety: Medieval English Devotional Literature in Translation. Cornell University Press. p. 100. ISBN 0-8014-8455-3. ^ Timothy Radcliffe (2004). Seven Last Words. Burns & Oates. p. 25. ISBN 0-86012-397-9. ^ a b The Hope of Salvation for Infants Who Die without Being Baptised, ITC, 22 April 2007. ^ Feingold, Lawrence. The Natural Desire to See God According to St. Thomas and His Interpreters. 2nd edition. Ave Maria: Sapientia Press of Ave Maria University. 2010. ^ Council of Florence Session 11 (Bull Cantate Domino): "With regard to children, since the danger of death is often present and the only remedy available to them is the sacrament of baptism by which they are snatched away from the dominion of the devil and adopted as children of God, it admonishes that sacred baptism is not to be deferred for forty or eighty days or any other period of time..."
^ Council of Florence Session 6 "..the souls of those who depart this life in actual mortal sin, or in original sin alone, go down straightaway to hell to be punished, but with unequal pains." ^ "Vatican City: Pope Closes Limbo". The New York Times. 21 April 2007. ^ "Limbo: Recent statements by the Catholic church, and Protestant views". Religioustolerance.org. ^ Verrill, Wayne (2012). The Yogini's Eye: Comprehensive Introduction to Buddhist Tantra. Xlibris Corporation. p. 68. ISBN 9781477150443. ^ "Interview with Leight Alexander". gamasutra.com. Look up limbo in Wiktionary, the free dictionary. Vanhoutte, Kristof K.P. (2018) Limbo Reapplied. On Living in Perennial Crisis and the Immanent Afterlife. Cham, Palgrave Macmillan. Wikimedia Commons has media related to Limbo. Herbermann, Charles, ed. (1913). "Limbo" . Catholic Encyclopedia. New York: Robert Appleton Company.